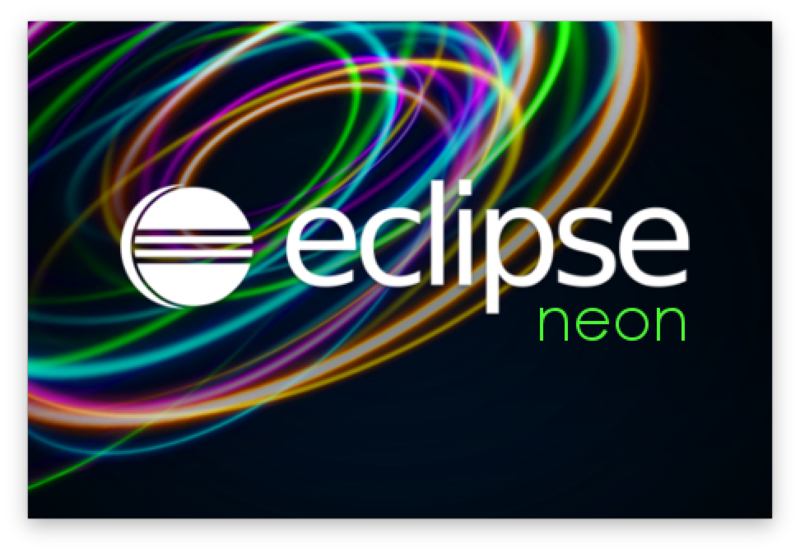 This and earlier milestones contain a multitude of fixes to enhance interactive and startup performance of the Eclipse IDE, and to reduce overall memory consumption. You can now style the background color of the SWT Link widget. 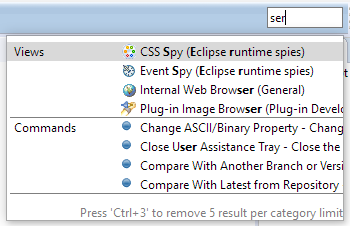 This is used in the default dark theme provided by Eclipse. It's now possible to replace the native scroll bar of a StyledText by a styled overlay. This is enabled by default in the dark theme on Windows. Quick Access (Ctrl+3) is a small text field in the toolbar. You can use it to trigger any command in the Eclipse IDE. The Full Screen feature is now also available on Windows and Linux. You can toggle the mode via shortcut (Alt+F11) or menu (Window > Appearance > Toggle Full Screen). When Full Screen is activated, you'll see a dialog which tells you how to turn it off again. A few new options have been added in the formatter profile editor. (1) In the new Parentheses tab, you can order the formatter to keep parentheses of various Java elements on separate lines, i.e. put a line break after the opening parenthesis and before the closing parenthesis. This can be done always, only when parentheses are not empty, or when their content is wrapped. There's also an > option to preserve existing positions, if you want to manually manage parentheses positions on a case-by-case basis. 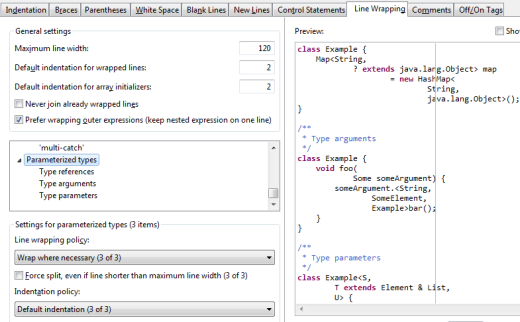 (2) In the Line Wrapping tab, you can set the wrapping policy for parameterized types. (3) Also in the Line Wrapping tab, you can decide to wrap before or after operators in assignments and conditional expressions.